18° A shower or two. Full time: A highly impressive 52point victory from the Swans over the Eagles as they rocket to the top of the table and they should be considered a strong chance for the premiership this year! GOAL SWANSJetta makes it 18 goals to 7 for the Swans since the Eagles booted the opening three goals of the game as he receives the handball from McGlynn and bends home his fourth! BEHIND SWANSKennedy swings through a minor score from 35 out and extends his side's lead out to 46 points with two and a half minutes to go. GOAL SWANSReid gathers the bouncing ball 55m out and Bolton lays a lovely shephard, Reid runs to the arc and drives through a stunning major from long range! What a goal! What a win! GOAL EAGLESSelwood is able to dish off the handball to Masten who steadies and rides home the goal but it is much too little too late for the Eagles. Swans lead by 39 points. 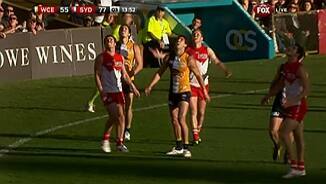 BEHIND SWANSReid tries to find he teammate running forward but the ball is thumped over for a minor score. BEHIND EAGLESBrennan slams his shot at goal in to the woodwork from 35m out. GOAL SWANSShaw floats a high kick toward goal and Bolton stands underneath it to take the grab. From point-blank-range and 30m out, he threads his third goal through the middle! Swans home. BEHIND SWANSJetta dribbles the shot at goal from 40m but it bounces through for a behind. GOAL SWANSKennedy with a one-two with Reid through the middle and he unloads from 55m and bounces home what should be the sealer! Swans out by 38 points! BEHIND SWANSMcGlynn swings a kick in hope at goal from the boundary line but misses to the near side. Swans by 32. GOAL SWANSEveritt crumbs the ball off hands and then brilliantly dishes off the handball to Bolton who steams in and drives home the goal! That could be that... Swans by 31. BEHIND SWANSO'Keefe registers a minor sore from 50m out and the margin is now beyond four goals - 25 points. 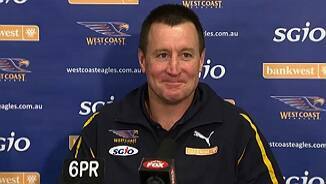 Another goal to the Eagles and the crowd will be right behind them and the pressure will be firmly on the Swans. GOAL EAGLESRosa drives the pass to the danger spot from the flank and Masten with great strength, nudges his opponent under the ball, he takes the grab, plays on and gives the Eagles hope! The final quarter is underway and despite a 30point lead to the Swans, I'm not yet willing to ride off the home team. 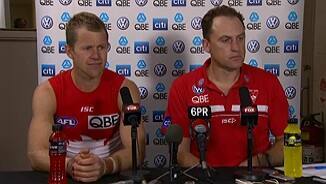 But the Swans are in a great position at the moment. At 3QT the Swans lead by 30 points after booting three goals to one in that third quarter, but in these games, you just can't ride off the team trailing at the final break. BEHIND SWANSMcVeigh leads to take the grab 45m out in the right pocket. He drags the shot to the right and the Swans lead by an even five goals. Darling has been subbed off the ground and he is icing his left hamstring so Stevens has been activated. BEHIND EAGLESNaitanui gets a very unkind bounce in the pocket, he gathers, gives it back to Newman but he misses under pressure. BEHIND SWANSJetta with a trademark run and carry through the middle, he sets sail from 55 but pulls it wide right. The Eagles are in desperate need of the next goal before this quarter comes to an end. The Swans' defence is holding up extremely well under pressure and they are not giving the Eagles' any room to work in to. GOAL SWANSBird shorts the pass to a leading Jetta who can have the shot from about 45 out on a difficult angle in the left pocket. He swings it through with a superb kick! Swans by 29! BEHIND SWANSMcKenzie punches the ball over the line under pressure for a rushed behind. RobertsThompson has been taken to hospital following that nasty knock late in the second quarter. GOAL SWANSAn astonishing goal from Bird as Hurn opts to kick the ball back into play deep in the pocket, it rolls to Bird who gathers and snaps through the major from the impossible angle! GOAL EAGLESRosa thumps the ball to the top of the goal-square and Naitanui nudges his opponent under the ball, takes the easy mark, plays on and knocks home the goal! Eagles are back! The crowd are not happy and are venting their anger at the umpires after a couple of nondecisions that haven't gone the Eagles' way. BEHIND SWANSEveritt has had an immediate impact as he tries for his second goal in two minutes but this time hooks it a bit too much. GOAL SWANSHolding the ball against Schofield and then Glass bombed the ball away and so the ump was forced to pay 50. Everitt, who has been activated for LRT, nails the goal! Ouch. The third quarter is underway and the Swans hold a handy 15point advantage, but it's anyone's ball game. It has been a brilliant first half of football and the Eagles have their work cut out for them in the second half after the Swans took control of the game late in that quarter. BEHIND SWANSA behind on the siren to McGlynn from 45 out on the run and the margin is 15 points at the main break in favour of Sydney. Play is stopped as RobertsThompson has been knocked out in a heavy collision with Brennan courtesy of an accidental elbow to the head. GOAL SWANSThe Swans on the fast break as Bird gathers at CHF and swings the pass to Bolton who is running forward, he gathers, takes a bounce and from the square, pumps it home! BEHIND SWANSHannerbery hits it inside 50 to Pyke who gathers, can he do it again? He swings it at goal from 45, but it doesn't bend back enough. GOAL SWANSThe Swans get the quick reply as O'Keefe works the ball forward out of the centre, Pyke pushes off Glass and gathers the footy deep in the left pocket and dribbles it through! 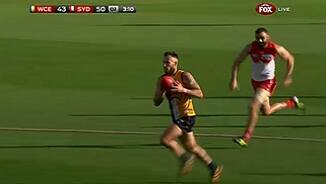 GOAL EAGLESSchofield taps the ball forward in the middle of the ground, Masten runs on to the footy, takes one, two, three bounces, runs to 25 and threads the goal! Eagles trail by a point! 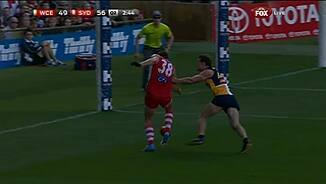 BEHIND EAGLESSchofield breaks the tackle and then swings the shot at goal but bends it too much from 25. GOAL EAGLESSchofield from the right half forward flank pumps it to the goal square where Darling works his opponent under the ball to take the falling grab! He can't miss from there! BEHIND EAGLESAnother behind to the Eagles as the ball is rushed over the line from Sheppard's shot and the lead is now 14 points. BEHIND EAGLESSmith drives Swift in the back and gives away the free. Swift will line up from 40m out but he too misses and the margin is reduced to 15 points. BEHIND EAGLESCox wins another free kick, this time on the half forward flank, and then the Swans' concede a 50m penalty for taking too long to give the ball back. Cox, from 35, tugs it right. GOAL EAGLESHolding Cox (no pun intended) inside the Eagles' attacking 50 and the ruckman takes the free kick from 20m out on a slight angle. He slots the much-needed goal. Swans by 17. GOAL SWANSHannebery drives it inside 50 to a one-on-one contest between Goodes and Brennan, they go to ground, Goodes get to his feet first, shins the ball in front of him and it rolls home! WOW! GOAL SWANSMalceski sends a lovely pass forward out in front of Roberts-Thompson on the lead. From 25m out on a slight angle, he pops it home and the Swans are out by 17 points! GOAL SWANSJetta roves the ball off hands in the right forward pocket and silences the crowd with a fine goal on thre run from 20m out to put the Swans 11 points in front. BEHIND SWANSMumford passes to full forward but to no-one's advantage and it rolls through for a behind. Kerr is the leading possession winner on the ground so far with 10 to his name. 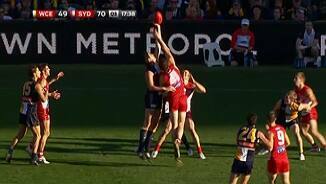 Kennedy and McVeigh have nine. The second term is underway and if the first quarter is anything to go by, we should be in for another thriller between these two teams. A stunning opening quarter that saw the Eagles open up a 20point lead but the Swans pegged it back and have grabbed the lead with a goal after the siren. GOAL SWANSO'Keefe pumps the ball to the hot spot and Reid is able to work under the footy and take the contested grab. He hammers it home as the siren sounds and the Swans have taken the lead! Two and a half minutes to go in the term and the Eagles lead by two points in a highly entertaining opening quarter. BEHIND SWANSJack, from the middle of the ground, spears a lovely pass to Reid who dives to take the mark about 45m out. He runs out to the right and hooks it left. GOAL EAGLESSheppard hands off to McGinnity who steers the pass to Darling who takes the grab out in front. 30m out and on a 65 degree angle in the right pocket, he guides it home with a super kick! GOAL SWANSThe Swans, in the blink of an eye, hit the front as McVeigh roves the Mumford tap down from the boundary throw-in and snaps it through for a great goal! Incredible! Fastpaced, ferocious, high tempo and a pressure-filled contest - just what you would expect in a battle between these two clubs. BEHIND EAGLESSheppard spears the pass in to the right pocket to hit Darling on the chest 45m out. He strikes it beautifully, but it fades late in the breeze. GOAL SWANSA free kick is awarded to Reid inside the Swans' attacking 50 and he makes the most of his chances as he nails the goal from 35 with little angle to speak of and the Swans are back! GOAL SWANSTwo in a row for the Swans as they win the centre clearance through Jack, McGlynn crumbs the kick wonderfully just outside the 50, runs to 40 and drills the goal! GOAL SWANSKennedy hands of out the back to Jetta who sizes up the sticks from outside the arc, unwinds from 55 and thumps it home for a beauty! Swans on the board! BEHIND EAGLESSchofield tries a bender from the boundary line but the defender is off line to the near side. GOAL EAGLESSelwood takes the mark on the right half-forward-flank and Roberts-Thompson gives away the 50m penalty for a push after the grab. Selwood drives through the goal from 25! Eagles flying! GOAL EAGLESHannebery rides Sheppard in the back 20m out from the sticks and the Eagle wins the free kick. Sheppard goes back and pumps home the Eagles' second major! GOAL EAGLESNewman gathers out of the congestion and swings the shot at goal from 40m out, it bounces once and dribbles home for the opening goal of the afternoon! Awesome start Eagles! BEHIND EAGLESSelwood fires at goal from 45 out and it is rushed over for a minor score. A late change for the Eagles as they lose Hams and in comes Newman. The Swans are as selected. The subs: Koby Stevens and Andrejs Everitt. This should be the match of the round! Underway! Welcome to Patersons Stadium for one of the biggest rivalries of the modern era: West Coast v Sydney. It's always a thrilling battle when these two meet, and today, they sit 1st and 2nd on the ladder.